Emil Nolde (1867-1956) was one of the greatest colourists of the twentieth century. An artist passionate about his north German home near the Danish border, with its immense skies, flat, windswept landscapes and storm-tossed seas, he was equally fascinated by the demi-monde of Berlin`s cafés and cabarets, the busy to and fro of tugboats in the port of Hamburg and the myriad of peoples and places he saw on his trip to the South Seas in 1914. Nolde felt strongly about what he painted, identifying with his subjects in every brushstroke he made, heightening his colours and simplifying his shapes, so that we, the viewers, can also experience his emotional response to the world about him. 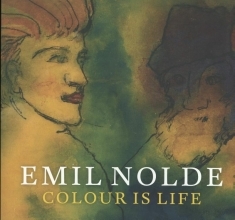 This book features five essays and over 100 illustrations drawn from the incomparable collection of the Emil Nolde Foundation in Seebüll (the artist`s former home in north Germany). It covers Nolde`s complete career, from his early atmospheric paintings of his homeland right through to the intensely coloured, so-called `unpainted paintings`, works done on small pieces of paper during the Third Reich when Nolde was branded `degenerate` and forbidden to work as an artist.